Lord, today we pray about the wildfire raging in Fort McMurray, Alberta, Canada. We praise you that all 88,000 residents were able to evacuate in time. They are safe, but we pray for their healing as they experienced the trauma of evacuating in the midst of “Armageddon”-like conditions. Help them move past this ordeal through trusting you and experiencing the support and love of those around them. 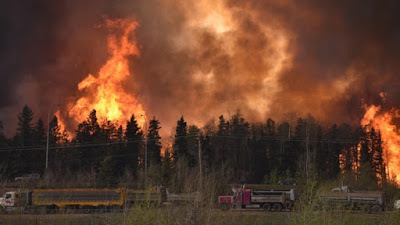 Bless those who are housing them, including those at the oil sands work camp, which has been pressed into caring for 10,000 evacuees. Lord, we pray for the hundreds of firefighters actively trying to save this city and contain the fires. Give them strength, courage and safety. May no lives be lost to save property. Yet may as much of the city’s infrastructure be preserved and the fire be contained. We pray in Jesus’ name, amen. Here is an update: http://www.bbc.com/news/world-us-canada-36244499. One way to help: http://covenantcompanion.com/2016/05/10/bible-camp-to-house-fire-evacuees/.